Whether you’ve been looking forward to this since the last day of school a few months ago or you’re anxious about this new beginning, the first few weeks of school are upon us. The prepared parent that you are, you’ve bought all the school supplies, agreed on new shoes, and filled out all the paperwork (you hope). And off they go! As your child falls into the rhythm of school, you might have a pretty good idea of the year ahead. Tests, quizzes, homework, and the like. But what about a hearing screening? Did you know they might have one of those, too? Don’t worry. A hearing screening is a great thing. In public schools in the state of Pennsylvania, for example, students in kindergarten, first, second, third, seventh, and eleventh, as well as ungraded special needs classes, will undergo hearing screenings. Every year, students are tested to make sure they’re hearing properly. If you’re a parent of a school-aged child, here’s everything you need to know about school hearing screenings. A hearing screening is not a full hearing evaluation. A hearing evaluation is performed by an audiologist and tests how well the eardrum functions, the health of the bones in the ear, how well the brain processes information, as well as speech discrimination. This test is much more thorough and can’t be performed by just anyone. A hearing screening, on the other hand, is much simpler. This test will determine at what level children can hear sounds in different frequencies, which means students will listen for sounds and signal if they heard them. A specially-trained medical technician or nurse can perform the test. 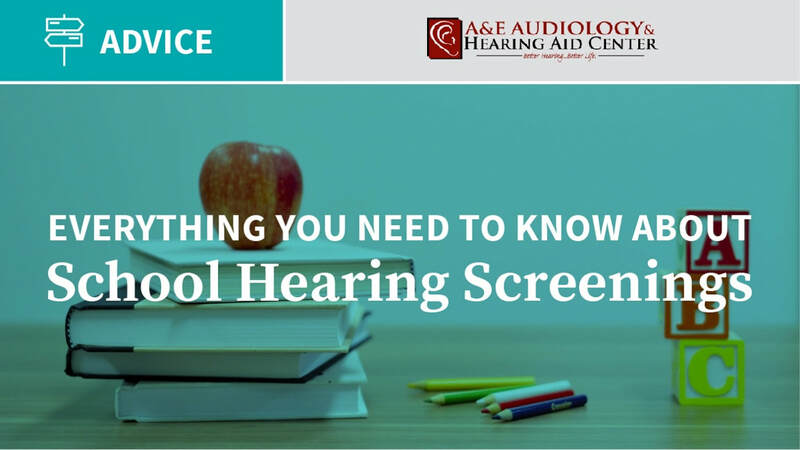 A screening is a great way to determine if a student shows any signs of hearing loss. Because the screening is performed in school during certain grades, the chance of catching it early and treating it are significantly increased. If any signs of hearing loss are detected, parents are notified so that further examination by an audiologist can be done. Undergoing a hearing screening is not just prevention, it is education. As a parent, you send your student to school for one main reason: to learn. You want your child to grow and develop the ability to make great decisions. Taking care of hearing health is a great decision to learn from the start. By repeating the hearing screening throughout schooling, your child will have a better chance of understanding the seriousness of hearing loss. We know you want your child to take care of themselves when you aren’t close by. Hearing screenings today will teach them just that. Imagine if you experienced hearing loss for most of your life, but didn’t realize the effects of it. You weren’t educated early on, so for you, hearing loss just become another part of life. Untreated hearing loss is known to be linked to dementia and Alzheimer’s. It can cause people to isolate themselves, disconnecting from those they know and love, resulting in a brain that slowly deteriorates from lack of its full, intended use. The longer the hearing loss is left without treatment, the quicker the individual will see the effects in their old age. They can recognize early signs and take action instead of “just living with it”. Their brains will thank them for it in the long run. Next time your student arrives home from school after a hearing screening, make sure to ask about it. Take the time to talk about hearing loss and the real effects of it. And while you’re at it, consider making your own appointment to have a quick hearing screening. Make this year the start of prioritizing hearing health. Your whole family will be thankful for it.